The garden gods were good to me last week when an afternoon movie netted a bounty of fresh, organic veggies and I became the lucky recipient of three huge, meaty, gorgeous Elbe heirloom tomatoes. 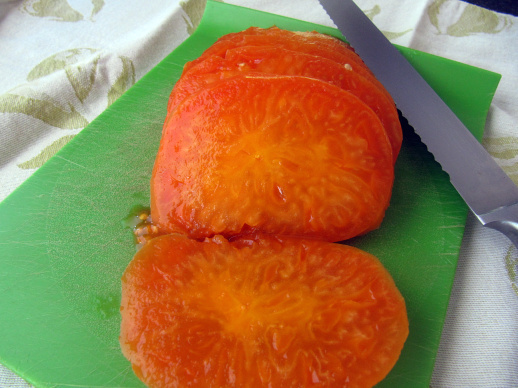 Named after the Elbe River in Germany, these award-winning beefsteak-like tomatoes have been an heirloom favorite since 1889. 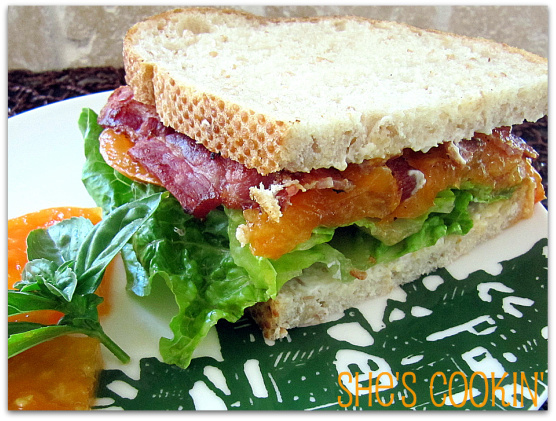 One of the golden orbs satisfied our primal craving for a good ole BLT – aaahh, summer and succulent tomatoes! Inspired by our recent “heat wave”, the other two became the perfect base for this unique gazpacho. They were overripe which meant all I had to do was plop them into the blender with the cooked onions and zucchini, add the buttermilk, and give them a whirl! Heat the canola oil in a large skillet over medium-high heat. Add the onions, sauté, stirring often, until the onions are translucent, about 4 minutes. Lower heat to medium and continue cooking until the onions are golden brown, another 5-6 minutes. Add the vegetable stock and zucchini to the skillet. Bring to a boil, lower heat to a simmer, cover and cook until the squash is soft, 12-15 minutes. Stir in the crumbled corn bread. Remove from heat and allow to cool. Spoon half of the squash and onion mixture into a blender or food processor, add half of the buttermilk and one of the tomatoes (cut in fourths if they’re not really soft) and blend until smooth. Pour into a large bowl. Repeat with the remaining vegetable mixture, buttermilk, and tomato. Add salt to taste. Cover and refrigerate for several hours until very cold. Serve chilled in bowls, stir in red pepper as garnish, it also adds a pleasant crunch to the creamy texture. * No cornbread? ½ cup of homemade bread crumbs can be substituted. 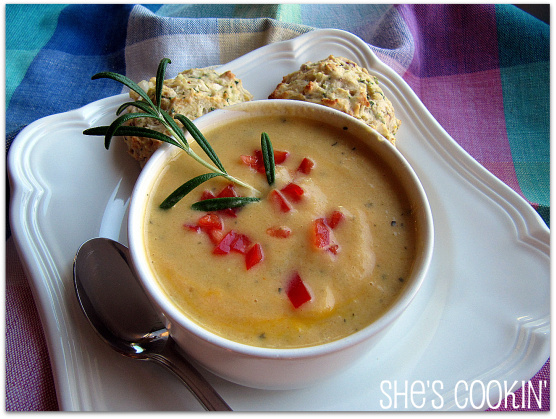 Eyeing those rustic drop biscuits alongside the gazpacho? Come visit on Monday for the recipe. Only 17 Days Until Thanksgiving! I love gazpacho, and this looks truly refreshing. Those are beautiful tomatoes. The BLT looks pretty darn good too! .-= fooddreamer´s last blog ..Chocolate Cream Tarts with Hazelnut Crust Low Carb and Gluten Free =-. What a wonderful twist on traditional gazpacho. These chilled soups are so refreshing during these hot days, and I love to see something that is so out of the ordinary. I just need to get some beautiful yellow tomatoes now! .-= Monet´s last blog ..Sugar and Spice-Cinnamon Raisin Bread =-. .-= Cristina´s last blog ..TeenieCakescom’s First Giveaway! =-. Thanks everyone! Not all yellow tomatoes will be as sweet as the Elbe, so you might consider adding a cup of sweet corn. Lisa & Cristina – hahaha, I knew, especially the bakers among us, would be drawn to those biscuits! .-= Magic of Spice´s last blog ..Whats for Dessert – Grand Marnier Cheesecake Mousse and an Award =-.